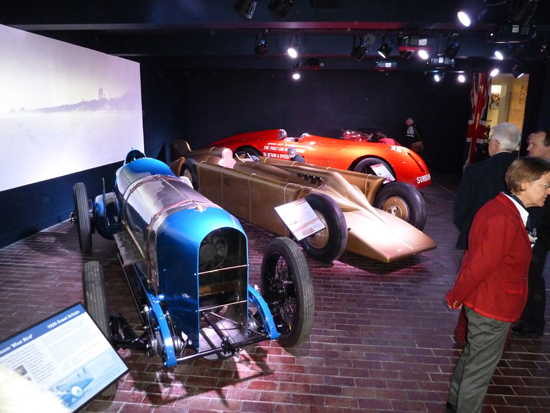 Three of the four Land Speed Record breaking cars in the new display at the National Motor Museum, Beaulieu. Sandwiched between the 350 hp and 1,000 hp Sunbeams is the strikingly-styled Golden Arrow. Ever since the dawn of motoring, the quest to achieve the fastest speed on earth has driven people and machines to the very limits of what is possible. The costs and the risks have always been very high, but through generations the rewards for those involved – in personal satisfaction for being ‘THE fastest’, and in terms of the accompanying prestige for their respective countries – have been deemed to be worth pursuing. British drivers, engineers, mechanics and vehicles have taken the World Land Speed Record on more occasions than those from any other country. At the National Motor Museum, four of the most significant British record-breaking cars, which have been part of the Museum’s collection for many decades, have been moved to a new, sophisticated display. 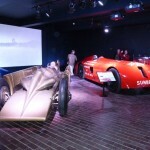 The four cars involved are the 350 hp and 1,000 hp Sunbeams, Golden Arrow and Bluebird CN7. These are now on display within a freshly constructed viewing area, with brilliant audio-visual backdrops depicting the vehicles in their heydays. 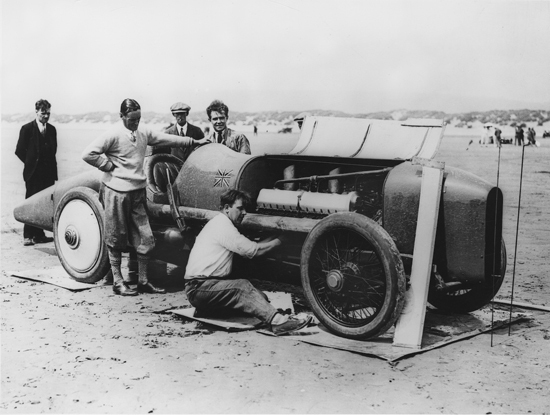 The 350 hp Sunbeam – powered by an aero engine – broke the Land Speed Record in 1922, at over 129 mph, with Kenelm Lee Guinness at the wheel. 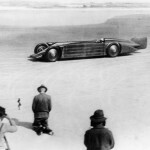 The car raised the record in July 1925, when driven by Captain Malcolm Campbell at Pendine Sands, at more than 150 mph. 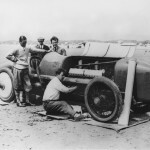 Major Henry Seagrave drove the 1,000 hp Sunbeam (powered by two aeroplane engines) into the history books in 1927, achieving over 203 mph at Daytona Beach, Florida. The stakes were raised again in 1929 by Seagrave, this time at the wheel of the Irving Napier Special, Golden Arrow, which officially clocked over 231 mph. Donald Campbell, son of record-breaker Malcolm, drove the Bluebird CN7 at more than 403 mph in 1964, taking the official ‘wheel-driven’ record for Britain. 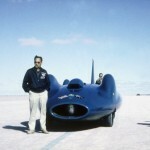 In subsequent years, jet-propelled (as opposed to wheel-driven) record breaking cars were permitted, so Donald Campbell’s brave drive in Bluebird truly signalled the end of an era. 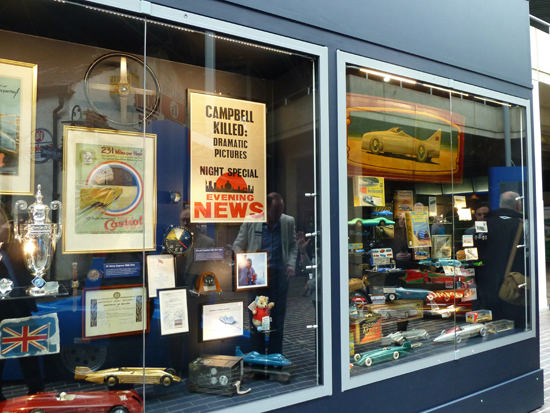 Alongside the main new display of record breakers are showcased a wealth of fascinating items of associated memorabilia. Adjacent to the four cars hugely important cars just mentioned, there are fascinating displays of memorabilia associated with the World Land Speed Record attempts through the years, and visitors can also enjoy seeing a collection of ‘alternative’ land speed vehicles – including those powered by electricity and steam. 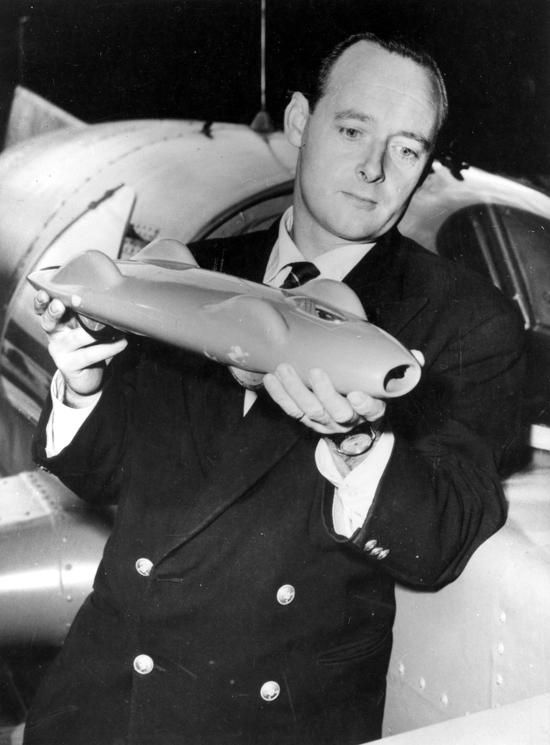 This is Donald Campbell, holding a miniature version of Bluebird. 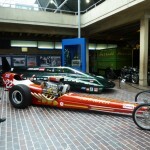 (Photo courtesy National Motor Museum). 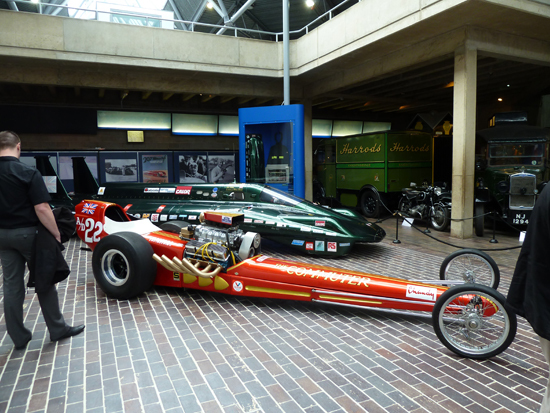 I was privileged to be at the recent opening of the new display at the National Motor Museum. I feel that this has been brilliantly set up, and wholeheartedly recommend a visit. During his opening address, he reminded those present that this year (2014) represents 50 years since his uncle Donald Campbell broke the world speed records on both land and water, in the same year. 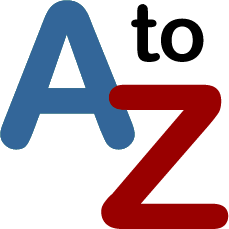 He also noted that during the 116 year history (so far) of the Land Speed Record, it has been broken 57 times, also that Britain has held the record for a total of 72 years out of the 116! This historic photograph (courtesy National Motor Musuem) shows Malcolm Campbell with the 350 hp Sunbeam at Pendine Sands in Wales, in 1925. 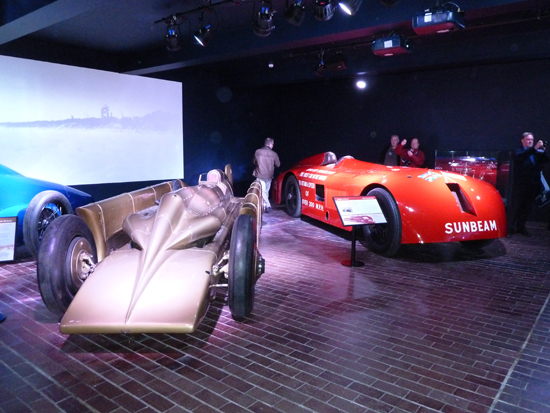 The Golden Arrow (left) raised the bar in 1929 (at 231.4 mph), with the 1,000 hp Sunbeam (right) having achieved over 200 mph in 1927 (please also see text). An amazing photograph (courtesy National Motor Museum) depicting Golden Arrow in action at Daytona in 1929. 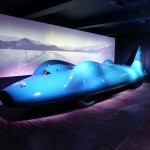 Forming part of the new display of World Land Speed Record breakers is Bluebird CN7, which clocked over 403 mph in 1964. 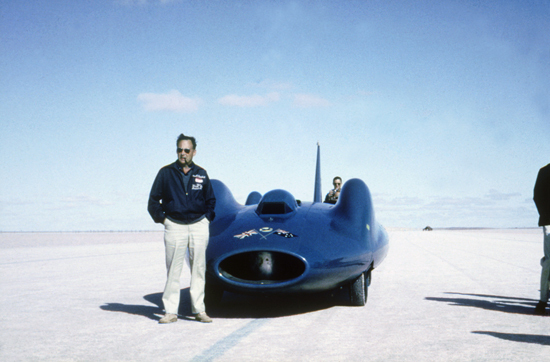 The historic sight of Malcom Campbell with Bluebird in 1964. 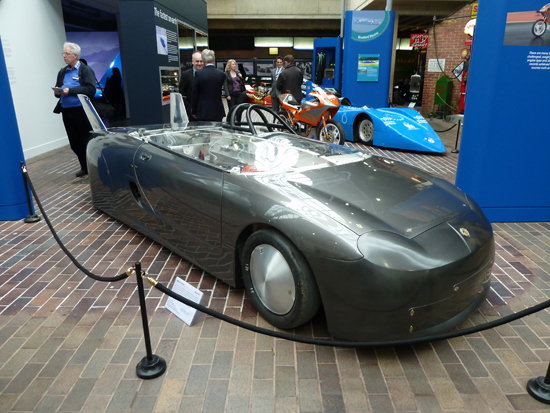 (Photo courtesy National Motor Museum). 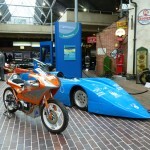 These are two of the ‘alternative’ record breaking vehicles on show at Beaulieu. In the foreground is ‘The Commuter’, and behind it can be seen the Inspiration steam car (driven by Don Wales). A happy record-breaking Don Wales, alongside the Inspiration steam car. 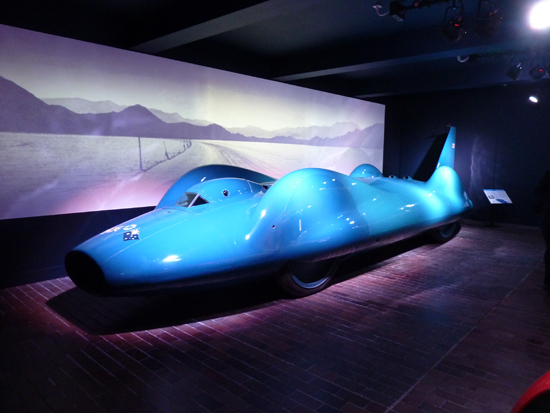 (Photo courtesy National Motor Museum). 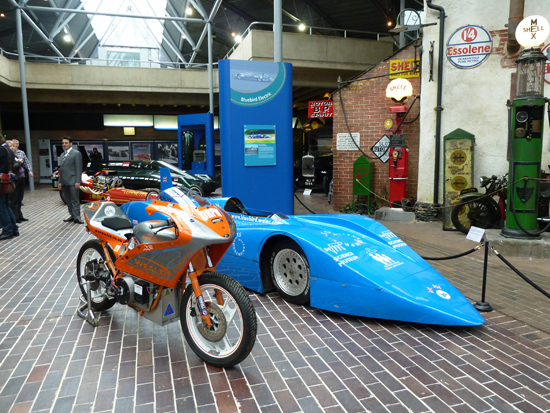 Further ‘alternative’ record breakers on show include this electric drag bike and Bluebird Electric. (Photo courtesy National Motor Museum). Another important vehicle forming part of the ‘alternative’ record breakers line-up is the 1988 MG EX 255 (powered by a 4.8 litre Rover V8 engine). 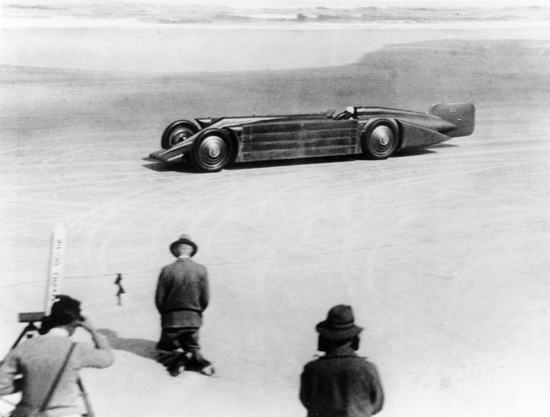 The World Land Speed Record is not just about past history. As I write, the quest to be ‘fastest’ continues, with the latest British bid taking the form of the Bloodhound SSC project. This brave, audacious and wonderful Land Speed Record attempt aims to take the new record to over 1,000 mph, in South Africa, in 2015. This is a huge challenge in many ways, but one that the Bloodhound SSC team is determined to overcome. 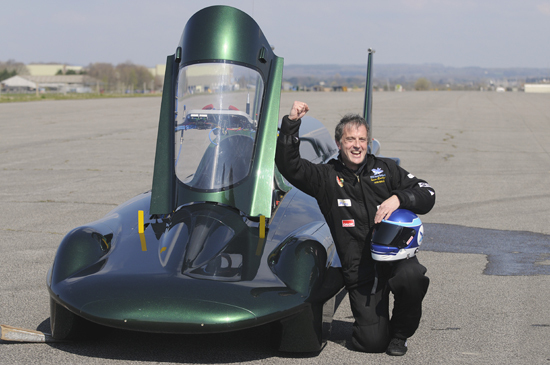 Notably, and driving the team, it involves the irrepressible Richard Noble OBE (himself holder of the Land Speed record, with Thrust 2, at over 633 mph, between 1983 and 1997) and Wing Commander Andy Green OBE, who drove Thrust SSC at 763 mph in 1997. 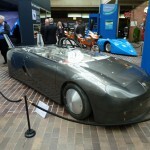 However, the Bloodhound SSC project is not just about achieving the Land Speed Record for the team involved, and for Britain, but it is also about encouraging youngsters into engineering (there is a serious shortage of engineering skills in the U.K.), and, more widely, it aims to help overcome various global technical challenges for people around the world, into the future.